Vegan birthday cakes make a great addition to a celebration. They are ideal for vegans and for people who follow a dairy and egg free diet. Leading a vegan diet needn't mean leading an austere diet. A vegan birthday or celebration cake can be enjoyed by vegans and non vegans alike and can be a healthy alternative to dairy and egg laden alternatives. What are Vegan Birthday Cakes? Vegan birthday cakes are cakes that have been created without the use of eggs or dairy products. It is also essential that the cakes are not made using other animal products that often get overlooked. This includes cochineal cake coloring, honey that is sometimes used as a sweetener and gelatin that may appear in some shop-bought cake fillings. This does not mean that birthday cakes suitable for a vegan diet will be boring. Cocoa, fruits, nuts and many other ingredients can all be added to make a very special birthday cake. Even those following a raw food diet can make a cake from raw food ingredients free from animal products. Butter - it is easy to substitute butter in recipes. Simply use a vegetable margarine or oil instead of butter in recipes. Watch out for low fat margarines as these are generally not suitable for baking. Sugar - bleached white sugar may have been processed in a manner that uses animal bones. Many vegans avoid bleached sugar and opt for unbleached cane sugar instead. Eggs - egg replacements are readily available and can be used in vegan cakes. Vegan recipes often use applesauce instead of eggs. This adds moisture to the cake. Honey - honey is simple to replace with syrup from a vegetable sources, such as maple syrup. Milk and cream - try using soy milk products instead such as soy milk or yogurt. A passable soy milk 'cream' can be made by reducing the amount of water required to reconstitute dried soy milk. No birthday cake would be complete without some form of frosting! Happily there are many ways to make great vegan frosting that is the perfect finish to a vegan birthday or celebration cake. Simple frosting can be made by substituting vegetable margarine or oil for butter in traditional recipes. Cream cheese frosting can me made using non-dairy cream cheese substitutes. 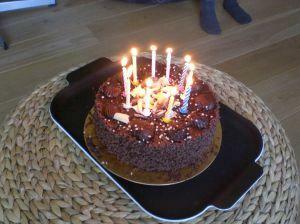 Savvy Vegetarian - chocolate birthday cake recipe that also includes a recipe and instructions for chocolate frosting. AllRecipes - cup cakes are hot right now. Make some vegan cup cakes as a great alternative to a birthday cake and decorate them with a selection of different flavored frosting. Food Network - recipe for coconut cake that uses tofu. Chow - vegan cupcake recipe. If there's one day of the year when someone deserves a treat, then a birthday must surely be it. This is not the time to scrimp on ingredients. Indulge yourself or someone else with a birthday cake made using the best quality vegan ingredients, and if it's a little indulgent, then just remember that it's only once a year. Don't be afraid to adapt and vary recipes. If you prefer something sweeter or less sweet than the recipe, then simply adjust the amount of sugar or other sweeteners used. Most cakes freeze well. Consider making double the batch and freeze a cake for another occasion. Go to town with the icing. This is what makes a birthday cake really special and don't forget a candle or two. A vegan cake can make a birthday extra special.